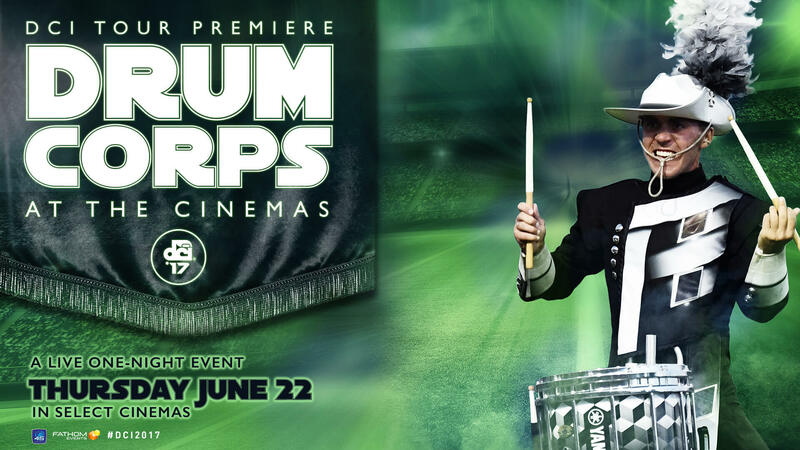 The Drum Corps International Tour is set to return to the big screen on Thursday, June 22, when the 2017 "DCI Tour Premiere" is broadcast live in select movie theaters across the country. Presented in partnership with Fathom Events and broadcast live from Lucas Oil Stadium in Indianapolis, the seventh-annual event will feature the season-opening debuts of the Blue Stars, Bluecoats, Cadets, Carolina Crown, Cavaliers and Crossmen. “The summer of 2017 marks Drum Corps International's 45th anniversary season, and we're very excited to share that milestone's kickoff event with marching music, arts and music lovers live in movie theaters nationwide,” DCI Executive Director and CEO Dan Acheson said. The two-hour program will show in nearly 500 U.S. cinemas through Fathom's Digital Broadcast Network on Thursday, June 22, at 8:30 p.m. ET/ 7:30 p.m. CT/ 6:30 p.m. MT/ 5:30 p.m. PT/ 4:30 p.m. AK/ 2:30 p.m. HI. Tickets can be purchased online at FathomEvents.com or at participating theater box offices. Some theater locations do fill up and spectators are encouraged to order tickets in advance. The June “DCI Tour Premiere” will mark the first of two cinema events presented during the 2017 DCI Tour. The 14th annual “Big, Loud & Live” broadcast of the DCI World Championship Prelims will take place on Thursday, August 10, featuring the performances of the top-15 competing corps.